There is little argument about the need for businesses to constantly examine their ability to provide value to their shareholders, customers, partners, etc. Likewise there is a general consensus that today’s global increasingly digitally-driven economy will only get more complex and continue to change. In his 1993 Harvard Business Review, Predators and Prey: a New Ecology of Competition, James F. Moore observed businesses exist as a part of an ecosystem. Within this ecosystem businesses (or enterprises) travel a path of evolution where they initiate, expand or change, and even possibly die. These evolutionary changes drive interactions with partners and competitors in the ecosystem. This ecosystem is visible in every aspect of business (local or global, private, and public sectors). The interactions are complex as well as always changing and are comprised of many different variables to include regulatory, economic, human, and technological. Changes in any of these variables are greater than the sum of their parts as they are always interacting dynamically with the potential for cascading failure or success equally possible. The need to actively architect the enterprise itself is not new. The father of Industrial Dynamics, Jay Forrester, talked about the challenges of designing the future enterprise in his presentation at the Universidad de Sevilla in 1998. His observations are just as timely today. The following quote from him identifies that it is not enough to merely operate the enterprise, but also deliberately design them. Certainly, no enterprise exists forever. The ongoing churn and rate of change as documented by analysis of Fortune 500 lists provides evidence that enterprises experience dynamic change, but that rate of change continues to accelerate. This is not to suggest there is an absence of deliberate enterprise design, but that much enterprise change appears to be reactionary in nature. Deliberate enterprise design requires a multi-dimensional professional to help lead multi-discipline planning and support for implementation. Proposed in Figure 1 is a model for representing the range of knowledge, skills, and abilities (KSAs) of today’s evolving EA professional. The figure represents five discreet dimensions with representative examples of the KSA for each dimension, not suggest an absolute or complete list. Over a decade of EA practice derives this model, educating enterprise architects and the privilege of interacting with EA professionals from around the world. Today’s Architects appreciate and develop their business acumen to include a deeper understanding of business models and cycles. This knowledge is instrumental in understanding the enterprises’ markets, operations, and value chain. Enterprise Architecture professionals are continuing to develop their value as multi-discipline planners and strategic assets with awareness of finance, human capital, and other factors of production. Many architects today came from technology ranks. The need to understand technological advances and how they influence the structure and behavior of an enterprise continues to be a key knowledge base for any modern EA practitioner. Technology knowledge for many architects continues to include network and software development skills as well as an awareness of technology cycles and impact of digital disruption can have on any enterprise ecosystem. The ability to coalesce multiple perspectives and develop coherent models of the enterprise to communicate across the range of enterprise stakeholders forms the core of a professional architect’s knowledge. Today’s architecture professional appreciates the need to be able to gradually unfold enterprise complexity through the use models (both visual and mathematical), especially those built upon solid ontological principles. 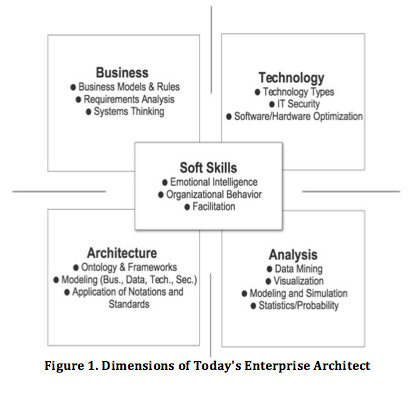 Arguably, an emerging knowledge and skill area is the application of formal Enterprise Architecture analytics. EA professionals have always appreciated the amount of information and knowledge contained within the EA models. However, with the emergence of techniques, such as process mining and big data management, architects are giving a renewed focus to further analyzing architecture to create additional enterprise advantage. Observation supports the realization that many enterprise architect professionals perhaps overlook this lynchpin skill set. The ability to gather stakeholder ideas, needs, wants, and requirements and communicate them to various internal and external enterprise stakeholders is an essential skill. Architects must develop emotional intelligence to understand how to not only navigate and manage the human condition, but also recognize their value in problem solving. Likewise, organizational behavior and the impact of culture must be an active part of developing effective enterprise insight. The model depicted in Figure 1 is deliberate in placing soft skills at the center of the other four quadrants. While all of the quadrants have varying degrees of overlap, it cannot be overstated the importance for EA professionals to be effective and practiced communicators. The evolution of enterprise architecture as a discipline continues in spite of the countless prognosticators repeating the contrary year in and year out. There are challenges as the discipline continues to define its scope and levels. In practice, there are many sub-disciplines all jockeying to define the importance of single scope over another. Discussions such as business architecture versus solution architecture continue. John A. Zachman has famously stated repeatedly that it is all enterprise architecture. Architecture is not a matter of which framework is most effective, what tools you need to have, etc. Instead, it is about having a rich portfolio of tools to help best address the problem at hand. One key to successful enterprise architecture is the development and evolution of multi-faceted professionals as practitioners. 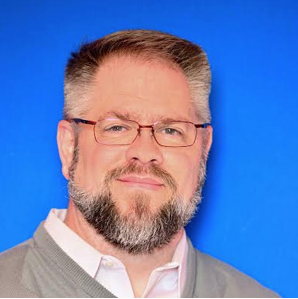 Dr. Scott Bernard, The Federal Chief Enterprise Architect, in a recent keynote address to Federal and Industry enterprise architecture professionals referred to this as the need for Renaissance Men and Woman as EA professionals. There is evidence of this evolution already taking place. Increasingly universities and industry are offering robust education offerings that are looking not only at the technical skills of documenting an organization’s architecture, but how to actively leverage it for enterprise advantage. Enterprise Architecture as a discipline continues to evolve and build not only a technical body of knowledge, but also a cadre of enterprise assets through its developing multi-dimensional professionals.